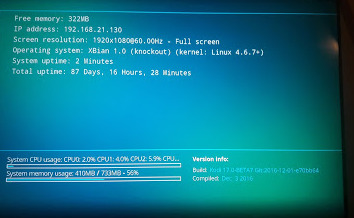 Great but, so the xbian-config gui will not initially work, with the update tomorrow? After testing Openelec , OSMC , and Xbian and Libreelec ! Xbian worked Great with HDHomerun and also OSMC 18 but Xbian does not support nfs/3 so the finale choice is OSMC on version 18 ! I just installed Beta 7 on rpi3, and the screen feels like when you have a 1024x768 setting on a screen that only supports 800x600. You have to scroll to see all the info, since it doesn't fit all on screen like beta5. Is this normal? (9th Dec, 2016 01:10 AM)dgarciam Wrote: I just installed Beta 7 on rpi3, and the screen feels like when you have a 1024x768 setting on a screen that only supports 800x600. You have to scroll to see all the info, since it doesn't fit all on screen like beta5. Is this normal? Sometimes Kodi detects wrong screen resolution (it happens in about 1 of 100 starts here, AFAIR I get 1600x1200). If this happens, I just have to set correct resulution manually and everything is ok. The problem is that is says the correct one. Should I switch to an incorrect one and then back to a correct one to see if that helps? If you click on it, you should be able to see the photo. Will try dropbox next to share pics. Well, i tried that and it is a no go. When I scale down the resolution, i get a smaller frame for kodi to display. 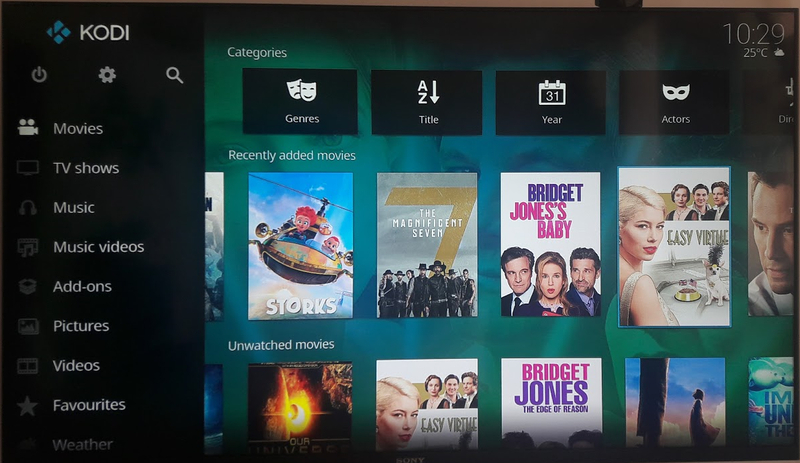 I still have to scroll movies/tvs and menus on the left down to see all. You see how the icons on the top are too big and you need to scroll right in order to see them all? I don't like to comment new Estuary skin v2. IMO home screen is completely overloaded and absolutely user unfriendly. Ok, i'm guilty of not realizing that there was more of your message after the link. (9th Dec, 2016 01:39 AM)Nachteule Wrote: That's normal. Beta5 was WAY cleaner. Hope they decide to clean this a bit more before release. Thanks for the answers and tips on sharing pics. Current time: 24th Apr, 2019, 07:01 AM Powered By MyBB, © 2002-2019 MyBB Group.